I’ve never been a huge fan of cauliflower growing up, or even a few years ago. However, recently I’ve been using cauliflower as the star ingredient for several dishes. 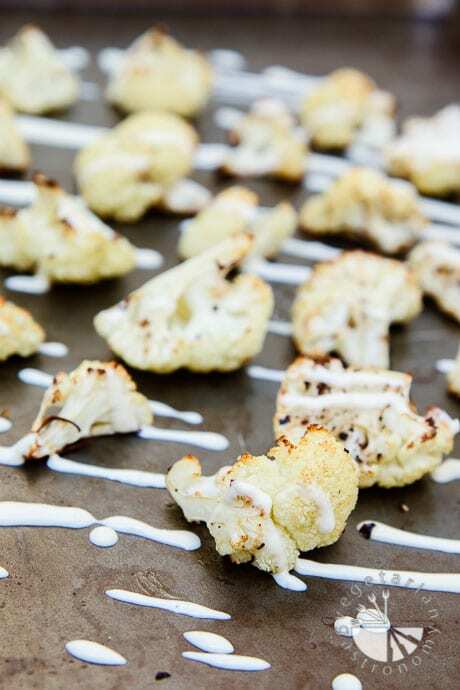 I started with my Roasted Cauliflower & Mushroom Soup, followed by Stir-Fry Cauliflower “Rice” with Tofu and Vegetables, and now I’m presenting this fabulous Roasted Cauliflower side dish! If you’re reading this and still don’t like cauliflower, I challenge you to make this side dish and NOT eat at least half the recipe! This dish is simple to make, contains minimal ingredients, flavorful, and absolutely addicting. It is a perfect side dish to serve anytime. You can even enjoy leftovers as an afternoon snack. I was first introduced to the delicious flavors of roasted cauliflower when making my Roasted Cauliflower & Mushroom Soup. If you recall earlier, I mentioned how I almost had to scratch the soup idea while developing it because I couldn’t stop eating the hot, roasted cauliflower florets straight out of the oven. With my new-found love of cauliflower, I’ve been on a recent kick of ordering it at restaurants whenever I see it on the menu, and have never been disappointed. A few months back, I had met up with a good friend for dinner at one of our favorite Italian restaurants in San Diego, Piatti. It was sort of a going-away dinner for her, because she was leaving San Diego and moving up to the San Francisco Bay Area (sad day for me). Of course when I saw some Herbed Cauliflower Cakes on their menu, I had to order it, and of course, we both devoured it. I started talking about my recent Cauliflower obsession and my friend mentioned trying roasted cauliflower with some tahini and lemon juice drizzled on top. Her idea sounded so delicious that I had to create a version in my kitchen. So today, I present to you Roasted Cauliflower with a Lemon Tahini Drizzle. I decided to make a simple, delicious tahini sauce with some tahini, freshly squeezed lemon juice (from our yard), garlic, salt, and some water to thin it out into a sauce-like consistency. I’ve tried and used many different brands of tahini from various grocery stores, but if possible, I would recommend purchasing tahini from your local Mediterranean or Middle Eastern grocery store. It tastes much better and the consistency is much more ideal to work. I used my Cuisinart Hand-blender with the Chopper Attachment (came together in my 3-in-1 purchase of a hand blender, whisk, and chopper… three kitchen gadgets which I highly recommend and cannot live without) to completely blend the sauce together while roasting my cauliflower in the oven. 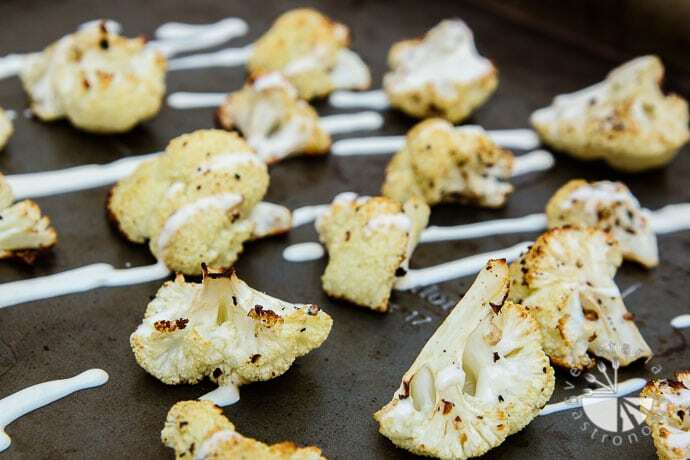 When you drizzle this sauce on-top of the piping-hot oven roasted cauliflower florets, the sauce really coats and melts right over to create a delicious creamy side dish. If you’re standing right above the baking tray with the finished product, you won’t want to stop eating them hot right out of the oven. This side dish tastes best hot, but also great at room temperature. 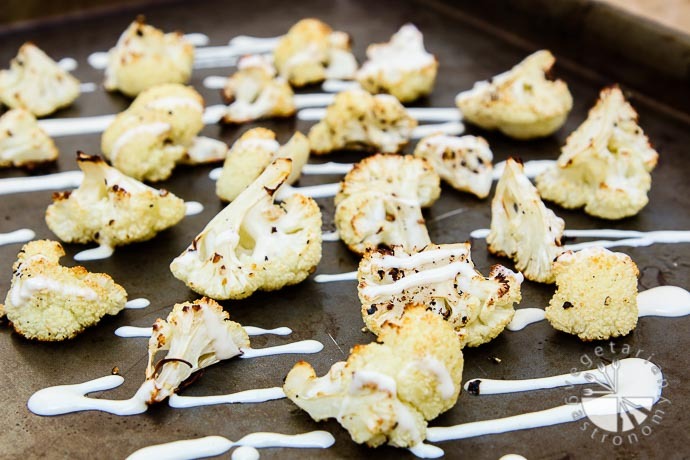 You can also re-heat the roasted cauliflower and then drizzle the sauce over the florets just prior to serving. When I made this dish for the first time, my husband and I were both amazed that between the two of us, we polished off an entire large head of cauliflower! Before I leave you with the recipe, I had a few quick announcements to make. First off, in case you missed my last post, go back to it and enter the fabulous GIVEAWAY I’m running on my site by Camelbak! Entering the giveaway is simple. Go to my GIVEAWAY post and read the bottom for details on how to enter to win THREE awesome Camelbak Water Bottles. The GIVEAWAY ends 11/23/2014. Good Luck! My second cooking class at the Whole Foods in Del Mar, CA. The class was held this past Saturday, Nov 8th in the morning and was very successful. 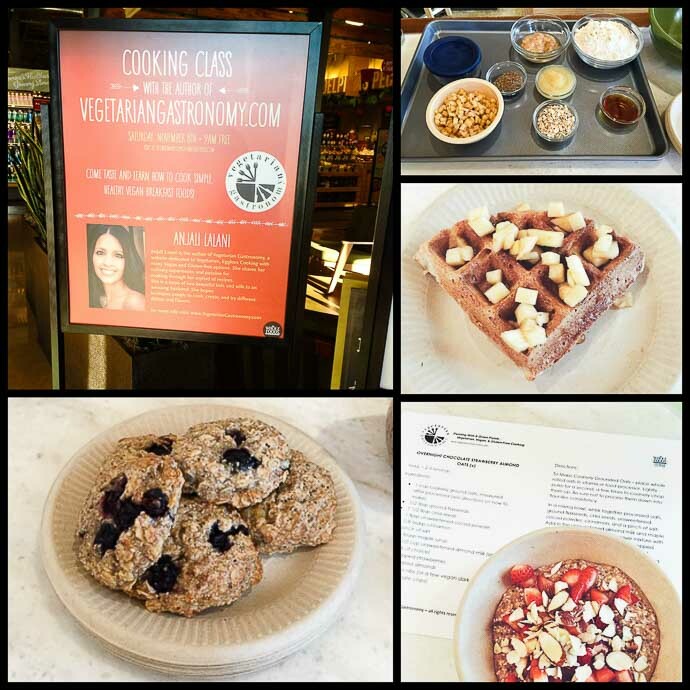 Thank you to those who made it to my class featuring some of my favorite Vegan Breakfast Food Recipes! It was such a pleasure to finally meet some of you. Everyone there absolutely loved all the recipes on demo that day. I ended up making way more food than needed, but left with not a single bite to spare, and we all had a fabulous time. I featured my Apple Cinnamon Waffles, Blueberry Banana Breakfast Cookies, and Overnight Chocolate Strawberry Almond Oats. If you live in the San Diego area, I hope to see you at the next one, which will probably run sometime in the new year because of the upcoming Holidays. 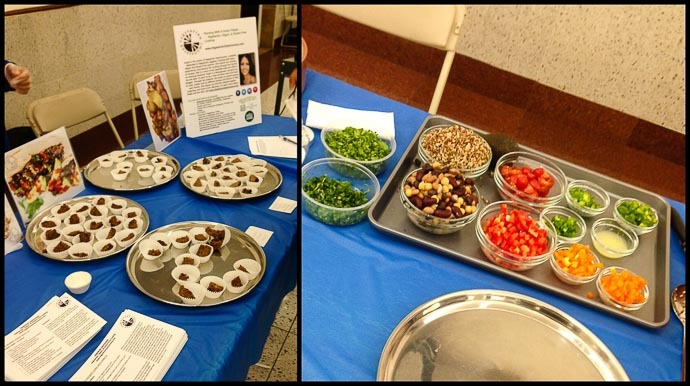 My demo and booth at the World Vegan Day Event. I featured and had a demo of my Four Bean Quinoa Veggie Tacos and sampled out my Blueberry Banana Breakfast Cookies and Banana Nut Bread. To my surprise, they had actually setup my booth and demo center-stage to the main hall where all the vegan samples, booths, and food was being served. It was great to chat with many other foodies at the event and people who were interested in trying out new recipes and cuisines. The host of the event did a fabulous job organizing, not to mention she made my tacos (with the help of others) for everyone at the event to sample during lunch. Thanks to those of you who attended and supported such a great cause! And now onto yet another delicious Cauliflower Recipe. Happy Thursday everyone! 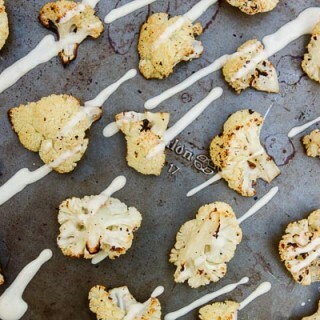 This quick recipe will change the way you feel about Cauliflower! 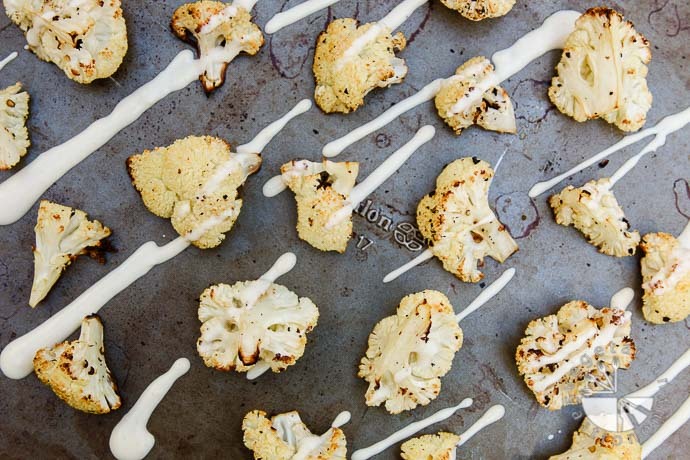 Oven-roasted and drizzled with a flavorful easy Lemon Tahini Sauce. It makes for the most perfect creamy melt-in-your mouth side veggie or appetizer! 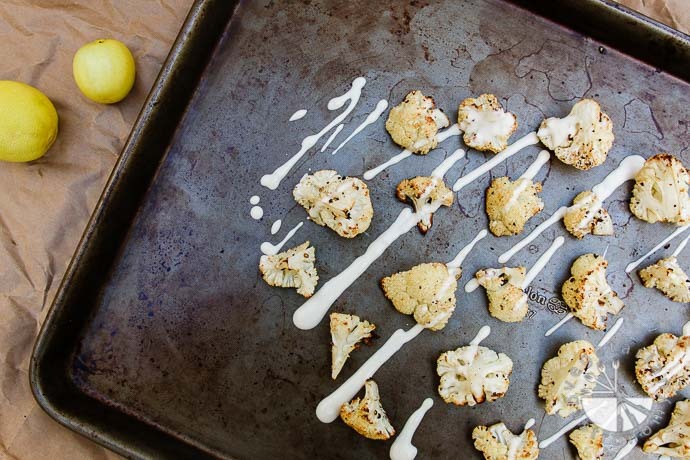 Toss the cauliflower florets with olive oil, salt, and pepper to taste. Spread the florets in a single layer on a baking sheet lined with parchment paper. Roast in the oven for about 20 minutes minutes until the florets are golden brown and roasted on the edges. While the cauliflower is roasting, make the sauce. Add all the sauce ingredients in a small blender or small food processor (note: depending on the lemons, you may need more or less lemon juice. I recommend starting off with less lemon juice and working your way up). Blend completely. 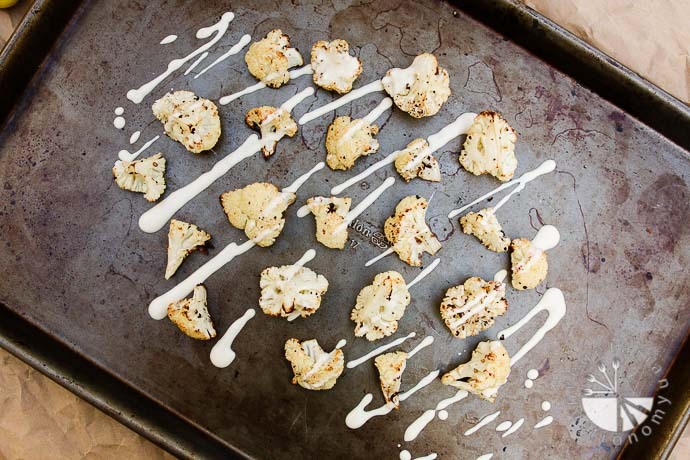 Once the cauliflower is roasted, remove from oven and drizzle on the sauce while the cauliflower is still hot so it melts right on. Enjoy hot or cold...it's delicious either way! 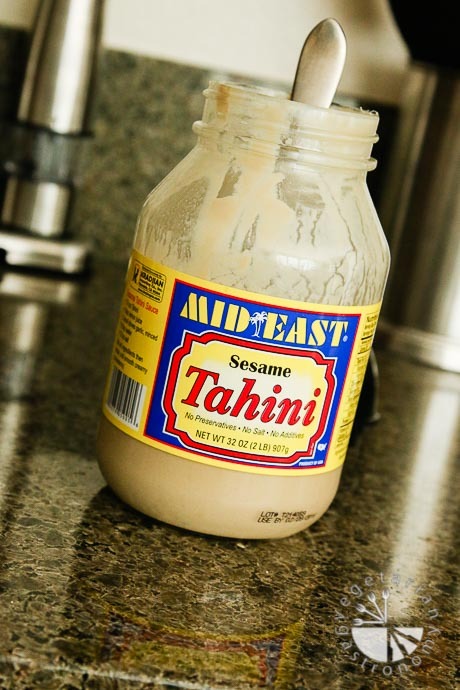 Tahini - I highly recommend purchasing Tahini from your local Mediterranean food grocery store. 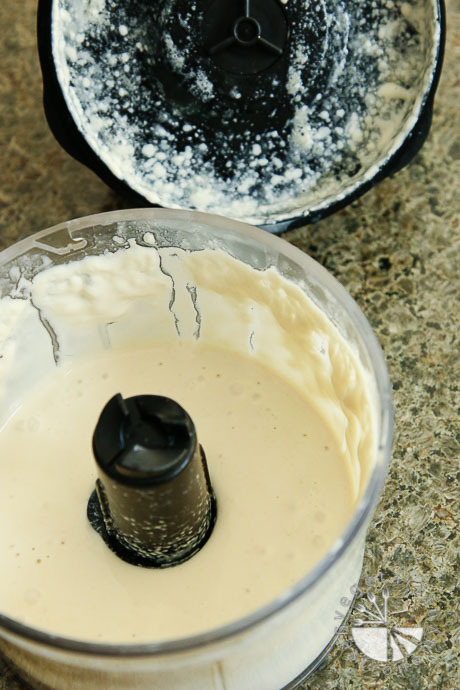 I've found this tahini to be pure and much better in consistency, taste, and easier to work with compared to tahini found at large stores. Loved hearing that the kids enjoyed it! This dish is great, especially when the cauliflower is nice and hot and the sauce coats over. I'll have to try adding ginger the next time I have to make this for someone who doesn't eat garlic! Thanks! If you like cauliflower and mushrooms, try my roasted cauliflower mushroom soup...I just made it again the other day!